The treasure today is the 1762 marriage record of Moses Smith and Patience Hamant in the vital record books of Walpole and Medfield, Norfolk County, Massachusetts. "SMITH, Moses and Patience Hamment, int., July 17, 1762." "SMITH, Moses and Sarah Clark, Dec. 2, 1756." Vital Records of Walpole, Massachusetts to the Year 1850 (Boston, Mass. 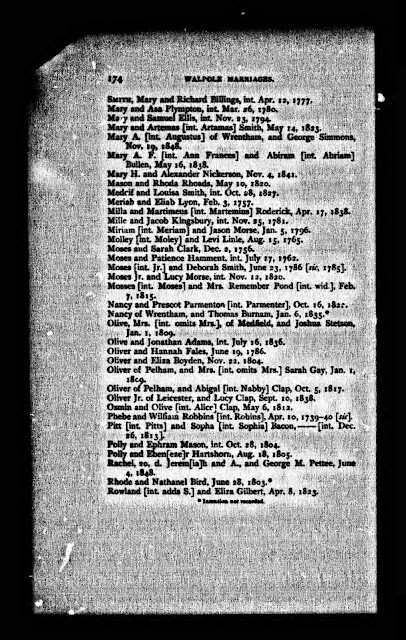 :New England Historic Genealogical Society, 1902), Marriages, page 174, Moses Smith and Patience Hamment (intentions) entry. "SMITH, Moses of Walpole, and Patiance Hammant, Sept. 23, 1762. *"
Note: The asterisk means "Intentions not recorded." Vital Records of Medfield, Massachusetts to the Year 1850 (Boston, Mass. 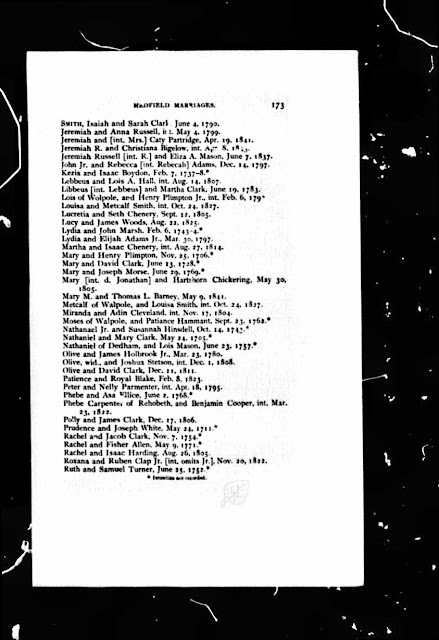 : New England Historic Genealogical Society, 1903), Marriages, page 173, Moses Smith and Patiance Hammant entry. Why are there entries in two different books? It is very likely that Moses Smith resided in Walpole and Patience Hamant resided in Medfield at the time of their marriage. It is not uncommon to see Massachusetts marriage records recorded in both towns. However, the entry in the Walpole book is for their marriage intentions - when they proclaimed to the church members their intention to be married, on 17 July 1762. The actual marriage was on 23 September 1762 in Medfield. Moses Smith (1732-1806) was first married to Sarah Clark (1731-1761) in 1756 in Walpole, by whom he had two children. Sarah (Clark) Smith died on 16 October 1761 in Walpole. Moses Smith (1732-1806) and Patience (Hamant) Smith (1731-1780) are my 5th great-grandparents. They had four children including my 4th great-grandfather, Aaron Smith (1765-1841). Such an old marriage record certainly is a treasure! I really like Internet Archive for old records like that. That's their version of the Walpole VR. I've downloaded now dozens of the Vital Records books for Massachusetts, Connecticut, etc.. I OCR the few that aren't already, cut and paste out of them, virtually highlight in them, bookmark them, and so on. It works out very nicely.